Find your perfect home in the Southern Village real estate listings below! Southern Village is a master-planned community that's been designed around New Urbanism planning concepts. This thriving community has been carefully designed to enhance every aspect of urban living, including walkability, connectivity, and stainability, just to name a few. Here you'll find an ample amount of mixed housing options, from single-family homes to townhomes and condos, and mixed-use areas to help bring you closer to amenities and activities. There's something for everyone in perfectly-sized pocket community in Chapel Hill! View all of the current homes for sale below or keep reading to learn more about Southern Village homes for sale and nearby lifestyle amenities. There's a delightful array of Southern Village homes for sale in the real estate listings above. Throughout the community, there's an underlying theme of old and new, which is even more pronounced in the architecture and aesthetics of the homes here. The most prevalent styles that you'll find here are Traditional and Transitional architecture with a dash of Colonial Revival to add a touch of history to each facade. This new-age community is characterized by either gorgeous red and brownstone or vinyl siding on the exteriors of the homes, and occasionally a mix of both. Single-family homes can range anywhere between one and three stories tall and are perfectly sized for families. Prices for detached houses in Southern Village start a little higher than other communities nearby, but that's mostly because it's one of the most sought-after real estate markets in Chapel Hill. Inside the homes you'll find a number of contemporary features that are typically found in move-up homes, like crown molding and wainscoting. Townhomes in Southern Village are ideally-sized for singles and working couples. They're considerably well-priced for first-time buyers, especially when you factor in the local amenities and conveniences that are so close at hand. Although they have a smaller square-footage than a detached house, you hardly noticed the difference thanks to an open-concept floorplan and high ceilings. These residences feature conventional kitchens with stainless-steel appliances and fixtures to match, hardwood flooring in the main living areas, carpeted bedrooms, and tiled bathrooms. Learn more about homes for sale in Southern Village by checking out our special edition blog post showcasing everything there is to love about this one-of-a-kind community! 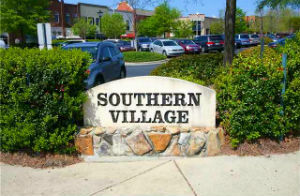 Check it out here: Neighborhood Spotlight: Southern Village in Chapel Hill. One of the best reasons to live in Southern Village is that the community was designed with you in mind. From public transit to recreation and modern conveniences, every aspect of this community has been consciously designed to optimize your lifestyle and enhance the way that you interact with your surroundings. Living without a car is a hard thing to do in many parts of North Carolina, but living in here, this dream could become a reality. All of your day-to-day needs can be found just a short walk from your home along pedestrian-friendly paths. Southern Community Park, sports fields & a community swimming pool. To learn more about Southern Village real estate and to request a showing, contact the team at My NC Homes today! Send them a message online or give them a call at 919-659-6173.